"All In With Chris Hayes" aired a rarity Friday, a solid hour of South Siders talking on a national news show. 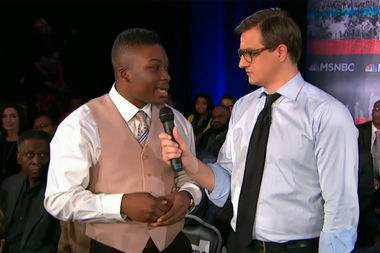 SOUTH SHORE — “All In With Chris Hayes” gave a national audience a look into how Chicago’s South Siders talk at community meetings — passionate, at times boisterous and weighted by years of economic struggle. The show filmed a town hall episode Thursday afternoon at the South Shore Cultural Center, 7059 S. South Shore Drive, but pushed the air date back to Friday after an appeals court ruled on President Donald Trump’s executive order on immigration. It was a rare moment of television where South Sider’s spoke up unchallenged and unabated for an entire hour of a national news show. “This is the way we do it here in the city of Chicago,” said U.S. Rep. Bobby Rush (D-Chicago). Chicago Police Supt. Eddie Johnson was there to respond to the frequent criticism of the Police Department, and admitted to some of the faults of the department. “CPD has done some things incorrectly and our challenge is to make sure those things don’t happen again,” Johnson said. Host Hayes picked out people to talk about the trauma of losing family members to violence and the broadly held opinion that the lack of jobs and educational opportunities is at the root of much of the violence in the city. And there was another person that people seemed to unanimously agree didn’t get it: Trump. It was a constant refrain during the show that Trump should come to Chicago — more specifically the South Side — and really talk to people and understand the issues facing its residents. Rush put forward one of the most forceful calls for Trump to come to town.